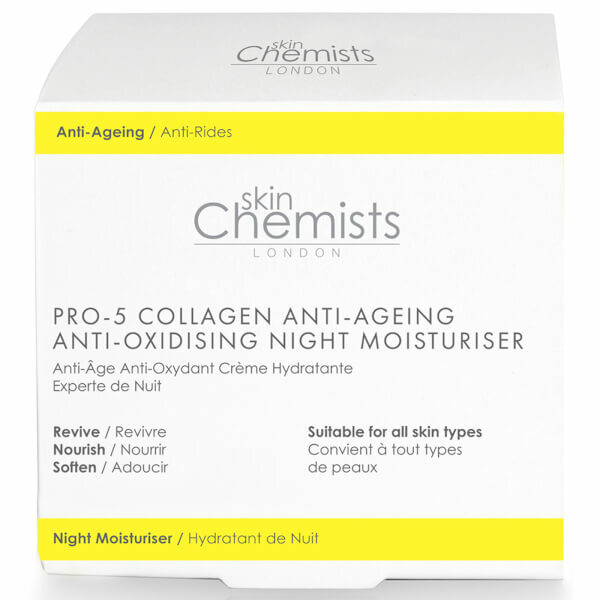 Awake to renewed, revitalised skin with the Pro-5 Collagen Anti-Ageing Anti-Oxidising Night Moisturiser from skinChemists London. 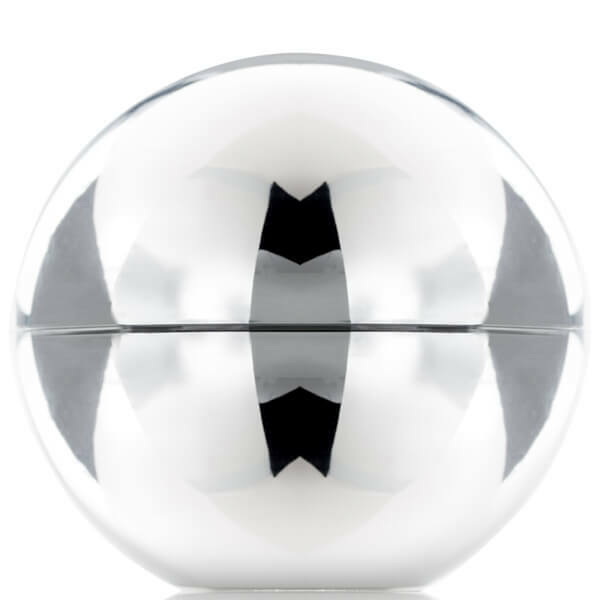 The lightweight, velvety night cream hydrates and nourishes the complexion as you sleep, strengthening the skin barrier to help defend against UV radiation, environmental stressors and damaging free radicals. 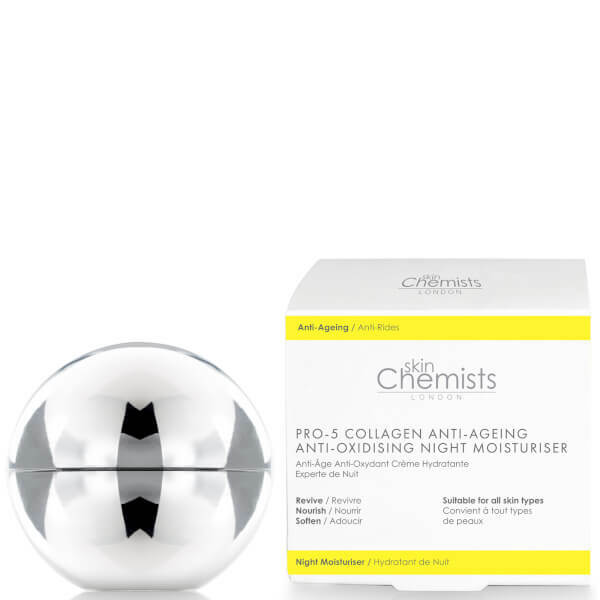 The formula is enriched with Aquarich – derived from Black Oat Extract – to restore moisture, and White Tea to balance the skin tone and promote a healthy glow, while Raspberry Seed Oil provides additional hydration. 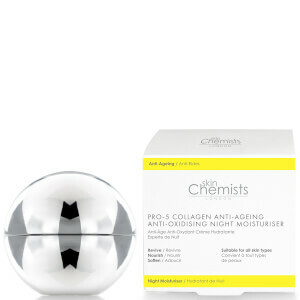 The result is an intensely conditioned, smooth complexion that imparts visible radiance. Aqua (Water), Coconut Alkanes, Raspberry Seed Oil, Glycerin, Glyceryl Stearate Se, Caprylic/Capric Triglyceride, Cetearyl Olivate,Benzyl Alcohol, Phenoxyethanol, Sorbitan Olivate, Coco-Caprylate/Caprate, Acacia Decurrens/Jojoba/Sunflower Seed Wax/Polyglyceryl-3 Esters, Carbomer, Sodium Stearoyl Glutamate, Limonene, Disodium Edta, Ascorbyl Glucoside, Dehydroacetic Acid, Vitamin E, Geranium Oil, Lecithin, Black Oat Seed Extract, Citronellol, Geraniol, Sweet Orange Peel Oil, White Tea Leaf Extract, Biosaccharide Gum-4, Linalool, Potassium Sorbate, Citral.